Two 5-year-olds, including Nicole Waterhouse of Westbrook, are getting the multi-office national talent-touting firm Faces International in trouble. The story about the kids and the loss of their small fortunes, first aired on Portland TV, drew national TV to Westbrook Friday. “Hard Copy,” a scandal-busting show that airs nightly on CBS, sent a producer from New York City and a camera crew from New Hampshire for 5½ hours of interviewing and filming at the home of Nichole and her parents, Carol and Robert Waterhouse, 1223 Bridgton Road. Faces claimed that it has “the world’s most prestigious talent marketing program” through a 500-plus page magazine. A salesman sold the Waterhouses a full page, which would have photos of Nicole, for $4,150. The magazine was never printed. Mrs. Waterhouse she expects to hear from “Hard Copy” people when the show will air. Westbrook’s Congin School, grades 3-5, is without heat. Leaks in the pipes that link it to the Westbrook Junior High School mean that Congin will have to get its own furnace, Superintendent Edward Connolly told the School Committee Wednesday. Replacing the underground lines would cost $138,000. He recommended two new gas-fired boilers. But there’s a catch – gas won’t be available until Northern Utilities extends its line along Cumberland Street. A solution needs to be in place before the cold weather, he said. After some discussion, the Gorham Town Council decided Tuesday to leave the date of Gorham municipal elections just as it is, the second Tuesday in March. They were considering a proposal that would have moved elections to either June or November. Roger and Peggy Marchand, and daughters Jessica and Bethany, 150 South St., Gorham, have a house guest for the school year – Jerome Sivry from L’escale, France, north of Marseilles. Jerome arrived Aug. 23 and celebrated his 16th birthday two days later in Maine, with the Marchands making him his usual birthday treat, chocolate mousse. Jerome registered as a junior at Gorham High School. Peggy says Jerome is a likeable, cheerful young man and a great student. George Walker, Cumberland Street, Westbrook, was honored with a surprise retirement party Aug. 21 at the Westbrook home of his daughter and son-in-law, Linda and Mark Herald. George retired from S.D. Warren after 38 years. He went to his daughter’s house for a cookout and found more than 30 people waiting to help him celebrate with food, music and horseshoes. Mayor Don Esty announced plans Tuesday to seek a fourth term as mayor of Westbrook. He will have to seek the nomination to run again from the Democratic City Committee at its caucus Sunday. Esty, 47, has served as an elected official in Westbrook for most of his life. He was elected to the City Council when he was 23, shortly after graduating from the University of Maine. Bruce Chuluda is the Republican candidate for mayor. Owners of the American Journal will start another paper, the Lakes Region Weekly, on Oct. 16 to better serve readers in the suburbs west of Portland. The decision to start a new paper serving communities around Sebago Lake was prompted by the continued growth in the area. The American Journal, which already covers Windham and Standish, will continue to carry news of those towns, but with the new paper can dedicate more space in the AJ to Gorham and Westbrook. Benjamin Toppi was recently named valedictorian at Nashville Auto Diesel College. He graduated with a 97 grade point average and an associate of applied science degree in auto and diesel technology. The son of Alan and Denise Toppi of Methodist Road, he is a Westbrook High School graduate. He has accepted a position with the R.C. Moore trucking company, as well as the drummer’s position with the Tony Boffa Band. The television stations of Maine PBS will introduce views statewide of Marguerite Lawler-Rohner, 2004 Maine Teacher of the Year, when Teaching with ME airs Sept. 24. Lawler-Rohner, an art instructor at Wescott Junior High School, recently accepted the award at a school ceremony. The Gorham Planning Board last week gave its support to a proposed recreation impact fee for all new houses, passing the measure on to the Town Council. The fee, which would help pay for new recreational facilities and the preservation of open space, would be $1,700 for a single-family, three-bedroom home. This amount would be added to the existing $2,200 impact fee created last year to help pay for the new middle school opening this fall. Emergency crews were called to the Gorham University of Southern Maine campus Wednesday to clean up a small spill of ammonia in Russell Hall, the home of the theater department. A technician was refilling the ammonia in a blueprint printing and copying machine when a leak in the gallon canister sprayed some ammonia onto the worker’s face. Following protocol with a dangerous chemical, the technician called Gorham 911. The building was evacuated for a time while the spill was cleaned. The Brown Street School was built in 1886 with two classrooms on the first floor and one upstairs. On Sunday, March 23, 1958, a fire of suspicious origin swept through the old school. The 73 pupils and their teachers were temporarily relocated to the Bridge Street School. 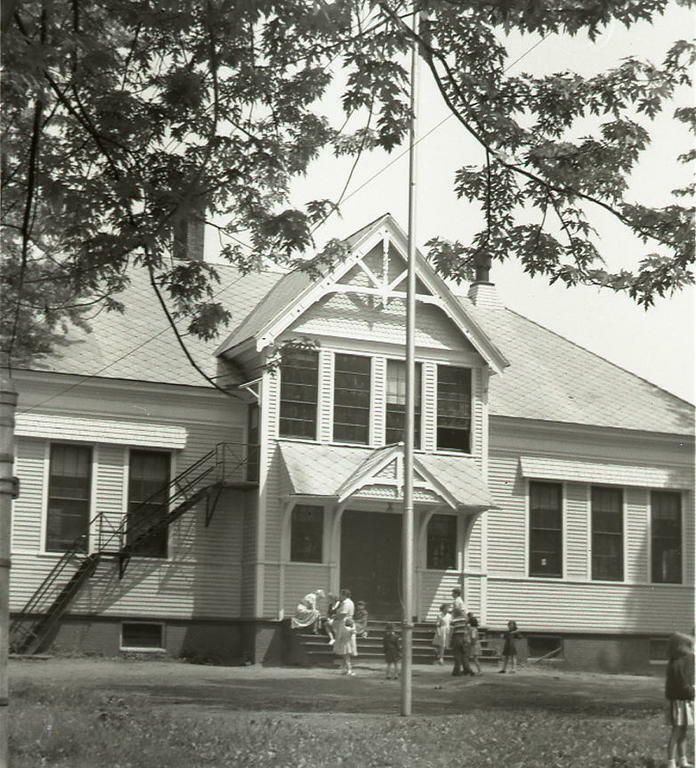 The Brown Street School was never rebuilt. Harmon & Barton Florists occupies the site at 117 Brown St. To see more historical photos and artifacts, visit the Westbrook Historical Society at the Fred C. Wescott Building, 426 Bridge St. It is open Tuesdays and Saturdays, 9 a.m.-noon, and the first Wednesday of each month at 1:30 p.m., September-June. Inquiries can be emailed to westhistorical@myfairpoint.net. The website is www.westbrookhistoricalsociety.org.